Need to get Linux to access the printers on your Windows server? Or Windows clients to access your Linux printers? Our expert walks you through both scenarios, using SUSE Linux and Windows 2000 Server as primary examples. Welcome to the first installment of Redmondmag.com's exclusive new column, "Integration Station." Every month, 'Nix and Windows author and trainer Emmett Dulaney will tackle some of the most common (and frustrating) interop scenarios, walking you through the best solutions from both sides of the fence. If you have a topic you want Emmett to tackle, a question or feedback on this column, or just want to say hey, be sure to post your comment below, visit the new Linux/Windows Interop area of our forums or e-mail Emmett directly at edulaney@iquest.net. – The Eds. One of the most common resources shared on networks today are printers. Thankfully long gone are the days when every user had a dot matrix printer sitting beside their desk with a box of perforated paper running to it. Networks today operate with the bare number of printers and stations needed spread throughout the worksite. 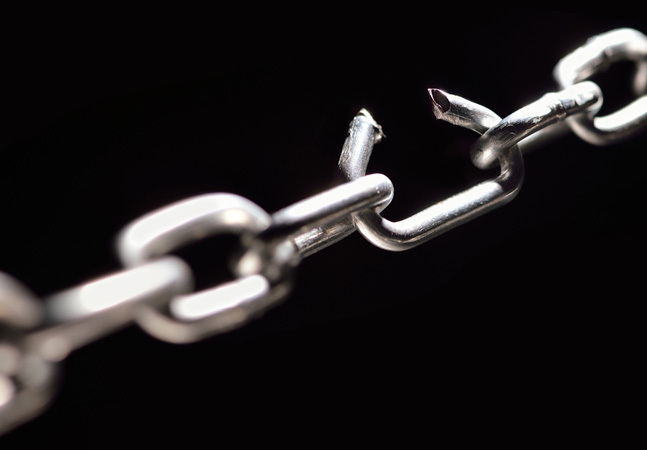 As networks have become more heterogeneous and begun including more than one operating system, those behind most OSes have seen fit to make the access to, and sharing of printers fairly straightforward. This is true not only of Microsoft (with Windows XP and the various flavors of Windows Server), but also of the companies behind most Linux distributions. While the Linux tools vary based upon the distribution, most feature the same functionality. For this article, I will look at the process of integrating the printers in two different scenarios. 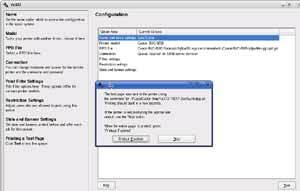 First, we will walkthrough the process of configuring SUSE Linux (formerly SuSE Linux Professional) to access a shared printer from a Windows 2000 Server. This illustrates the means by which Linux desktop clients can access printers on a Windows network. You should know that, as with most things Linux, there is more than one way to accomplish each of these tasks, and I am attempting to illustrate the most straightforward. Following that, we'll walkthrough the process of configuring a Windows XP Professional client to access a printer on a SUSE Linux Enterprise Server. 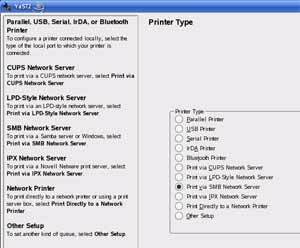 Again, there are many ways to approach this, but the method discussed here illustrates the means by which Windows desktop clients can access printers on a Linux network. 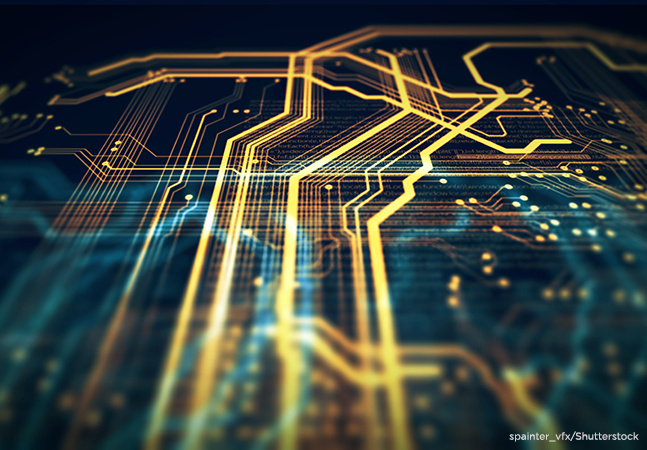 Having looked at the issue from both angles, you should be comfortable with integrating printing in your heterogeneous network. In this scenario, a color printer (Canon BJC 8200) is connected to a Windows 2000 Server named Traveler and is using the spool name of LocalCol. A SUSE Linux 10 client is being configured to access this printer. To start the configuration, use the printer tool available in your version of Linux and make certain you have administrative (root-level) privileges. In SUSE, there are a number of ways to arrive at the same spot, but the best tool to use is YaST (Yet another Setup Tool). Once this is started, choose Hardware and then Printer. Note that depending upon your settings, you may have to modify the firewall configuration in order to allow Samba to work properly (more on this in the "Possible Complications" section later in this article). 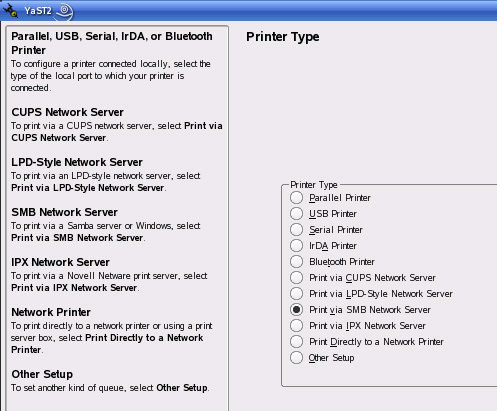 When prompted to choose a Printer Type, select Print via SMB Network Server, as shown in Figure 1. Figure 1: On the Linux client, choose to print via SMB Network Server. Within the Connection Information frame, the name of the Print Server (the Windows Server, in this case) must be entered along with the Remote Queue name (see Figure 2). Figure 2: Enter the corresponding connection information and click Next. Notice that the Workgroup information was not entered in this case as the name between the two is the same. If the server is on a different workgroup, that field needs to be entered as well. A username and corresponding password is entered, and you should choose to Test Remote SMB Access simply to see that the firewall is allowing the connection. An interesting condition exists with the username and password. They are stored and used with jobs as they are submitted to the printer. Given the sensitive nature of the values, the password appears as asterisks on this configuration screen, but -- surprisingly -- only on this configuration screen. When viewing Printer Configuration, the values appear in clear text. For example, if the username is edulaney and the password is bubbles, then the value in the Printer Configuration dialog boxes will always appear as /edulaney:bubbles@traveler/localcol. While there is little you can do about it, it is something you need to be aware of should other administrators also view printer configuration on your network. Next, you must choose the printer manufacturer and model. Finally, you are given the option to test the printer at the configuration summary screen (see Figure 3). Figure 3: Once configured, test the printer before continuing on. The client can now print to the printer on the Windows network. Always use this opportunity to make certain the printout is correct before clicking OK. 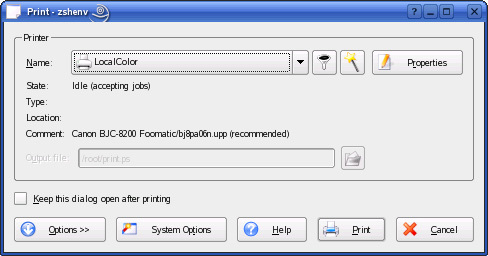 The printer configuration is saved, you are free to exit YaST, and use the printer as shown in Figure 4. Figure 4: Success! The printer now appears as a print option and can accept print jobs. 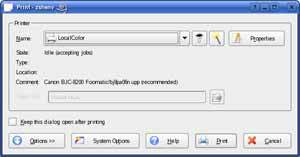 In this scenario, a color printer (Canon BJC 8200) is connected to a SUSE Linux Enterprise Server 9 server named “linuxone” and is using the spool name of “color”. A Windows XP client is being configured to access this printer. When Windows clients talk with Windows print servers, they download the drivers they need -- if possible -- from that print server. Since it does not work quite that way when Windows is talking to Linux, the method used here installs the needed drivers on the client. 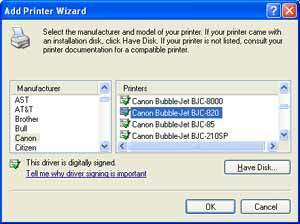 On the Windows XP client, start the Add Printer Wizard (Start, Printers and Faxes, Add a Printer). Choose to add a network printer, then select to add a printer connected to the Internet or on a home or office network, as shown in Figure 5. Notice that port 631 (for CUPS) is used, and the name of the printer is the same as what it is known as on the Linux server. 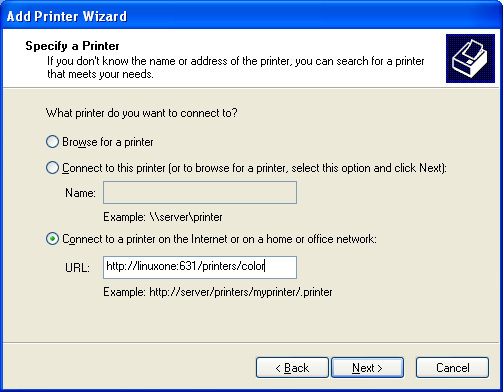 Figure 5: Use the Add Printer Wizard to find the Linux printer. Choose the manufacturer and printer (see Figure 6) and the driver files will be copied over. Figure 6: Choose the correct printer to load the appropriate drivers. Choose whether this printer will be the default or not, and agree to the settings at the summary screen. Next, open the printer’s properties (right-click on the icon and choose Properties) and choose Print Test Page on the General tab as shown in Figure 7. Figure 7: Always print a test page to make certain you can access the Linux printer. The printer can now be accessed on the Windows client the same as any other printer on the network. Though the examples given here were very straightforward, there are issues that can complicate the matter. One of the most troublesome is the need to allow traffic through the firewall in order to be able to communicate. If you are going to allow remote configuration of the printer, you typically have to allow HTTP through (port 80) as well as those related to SMB (137-139) and LPD (515), not to mention CUPS (631). If JetDirect is used, it utilizes port 9100 by default. 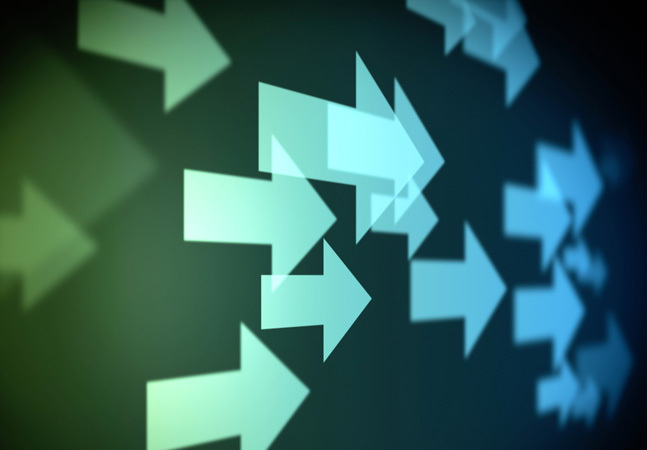 Name resolution can also be a very tricky issue with an integrated network. If the host name does not seem to be found, you have a couple of tricks at your disposal. 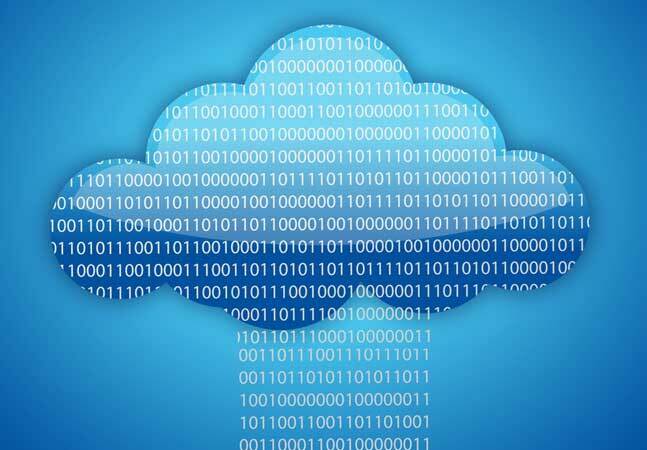 The first is to replace the name with the IP address (assuming the addresses do not change frequently) and the second (also dependent upon addresses remaining relatively the same) is to add the hostname and associated address into the hosts file. On Linux clients, the file is /etc/hosts, while on Windows XP clients, the file is \Windwsystem32\drivers\etc\hosts. Lastly, there are a number of tweaks that can be done in the Samba configuration file /etc/samba/smb.conf that can change some of the printing operations (for better or worse). Samba is the topic of an upcoming article and these tweaks will be addressed then. Now that the Integration Station column has come to fruition, it is time to create a framework for it. One of the main problems with discussing the topic is that “integration” can mean many different things to various administrators. Because of that, next month the focus will be on what is Linux/Windows integration, followed by more hands-on integration topics – including some I hope you’ll suggest. Be sure to post below, in our forums, or write me at edulaney@iquest.net.